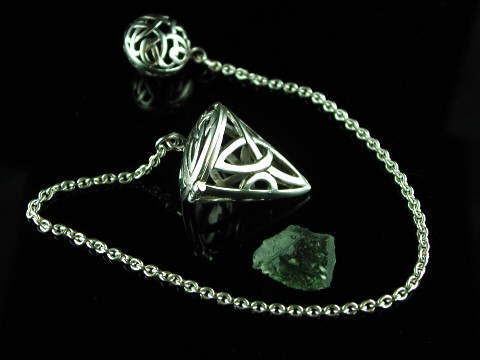 Stunningly beautiful 925 sterling silver Celtic design Moldavite pendulum. This pendulum is very well made in a traditional Celtic triqueta design. It is finished with a substantial sterling silver chain and a lovely Celtic knot work topper bead. The top part of the pendulum is hinged and opens to accommodate a rough piece of Moldavite, but you could of course place any crystal in the chamber that you felt drawn to dowse with. Due to both its beautiful design and versatility, this pendulum could be the only one you ever need use, and if looked after with love & care it could last you a lifetime. From a metaphysical view, due to its extraterestrial origins, Moldavite knows no bounds and makes for an extremely powerful dowsing tool. It enhances your intuitive abilities and is said to be able to help us communicate with the Cosmos.